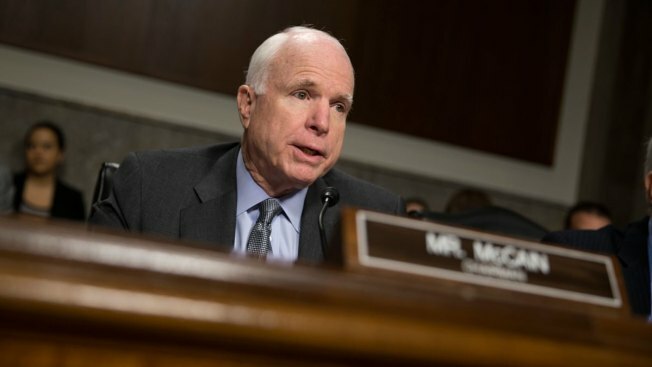 In this Feb. 9, 2016 file photo, Senate Armed Services Committee Chairman Sen. John McCain, R-Ariz. speaks on Capitol Hill in Washington. The president of the U.S. Hispanic Chamber of Commerce has endorsed Sen. John McCain for Senate re-election, NBC News reports. "I am honored to receive the endorsement of the U.S. Hispanic Chamber of Commerce ... Hispanic businesses are vital to Arizona's economy and add to the cultural fabric of our state," McCain said in a statement. The endorsement is significant because of Arizona’s history of immigration crackdowns and their effect on Latinos in the state. The eligible Latino voter base in Arizona is 21.5 percent. McCain faces a primary challenger from the far right, state Sen. Kelli Ward, as well as business owner Alex Meluskey.